Kolea Palakiko has a goal that one day the subject of mental health becomes so casual that people are no more afraid to talk about their emotional wellness than they are their physical wellness. 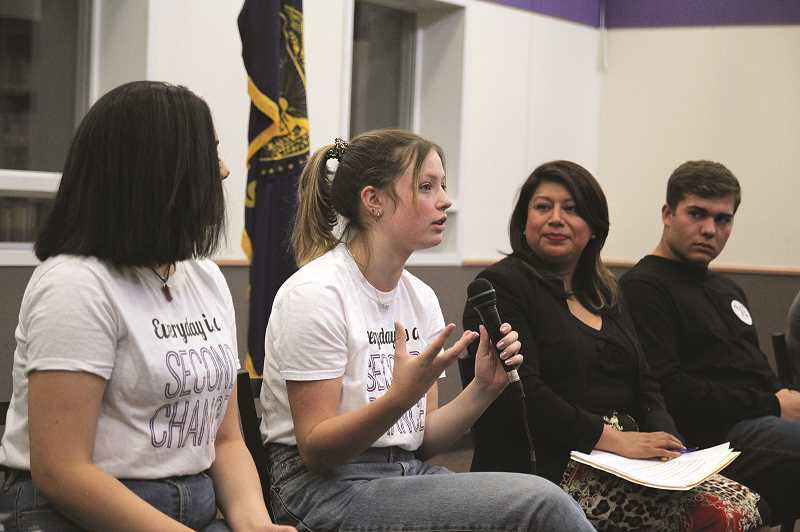 Palakiko was one of four youth mental health advocates who were joined by Sen. Peter Courtney and Rep. Teresa Alonso Leon for a town hall panel at Woodburn High School in September. The event was sponsored by Lines for Life, a national suicide prevent service, coordinating with local youth advocacy organizations YouthLine and Youth ERA with the goal of challenging the stigma that is often associated with mental health. "I think it's as important as physical health," Palakiko said. "A lot of stigma has to do with people not understanding mental health. It's just that we're not educated on the subject of mental health, which drives people to feel so alone and hopeless to come to the point of suicide." Suicide is one of the leading causes of death for children and adolescents, and the six panelists spoke for more than an hour to highlight the need to make the subject of mental health one that is not just accepted, but embraced. It is a subject that is gradually becoming more normalized through each new generation, Courtney said, due to the efforts of young people like Palakiko. As a member of YouthLine, Palakiko works as a crisis support volunteer, providing peer-to-peer conversation via text message or phone conversation to fellow teens and young people who are experiencing a mental health crisis. "Just being there for someone can do extraordinary things," Palakiko said. "There's been times when I don't know what to say, but me just being there and listening does wonders for them." She was joined by Molly Benjamin, another member of YouthLine, who stated that just by talking about mental health and suicide helps break down the social barriers that society puts up against the subjects. "We need better awareness to get rid of the stigma," Benjamin said. "As we progress further in this mental health journey, that's just what comes with it — more people qualified and more people wanting to talk about it." Courtney suggested that the mental health crisis needs to be addressed by each individual before it ever becomes as normal as going to a doctor. He admitted that several decades ago, he would not have felt comfortable publicly acknowledging that he sees a counselor, but now he feels no indignity with saying as much. "I've reached the conclusion that until every person personalizes mental health, this thing will never happen," Courtney said, addressing the crowd who attended the panel. "I don't know how many people have seen a doctor, but I bet you everyone in here has seen a doctor multiple times. You don't even think a second about it, you go see a doctor." Alonso Leon echoed Courtney's sentiments, noting that the stigma surrounding mental health exists for all cultures, and removing that barrier makes it that much easier to address in the open, rather than seeing the subject as taboo. "We just need to normalize it," Alonso Leon said. "We need to be able to identify as another physical need. The more we talk about it, the more we're open about it, the more we start removing that stigma." Carson Lydon, a peer support volunteer for Youth ERA, said that while adults can provide significant ways to help through advocating for mental health in government, it is often better to have youth support at the ground floor when other youths are feeling depressed and in need of someone to talk to. "My friends wants to listen to a 16- or 17-year-old kid or a young adult who has gone through this," Lydon said. Speaking from those in attendance, Carlos, a staff member at Youth ERA's after-school drop-in site in Salem, agreed, saying kids are more receptive to those who have gone through the same social and mental anxieties. "Being able to have that lived experience can be really helpful in supporting another young person," he said. "I think a young person is going to be much more receptive to someone who can really understand. That's what makes these two organizations really effective." Alonso Leon wants to see the issue addressed both on the ground through youth advocacy groups like Youth ERA and YouthLine, while utilizing schools as a hub for resources and information, where adults have access to students and can help directly. "If we have multi-lingual social workers, they can help educate the parents, they can help the parents navigate the school system and its resources that are available to them," Alonso Leon said. "Any time we have any kind of program or service available, we need to look at it to make sure it's offered in multiple languages and offered in a culturally responsible way, because we're all trying to understand this thing called mental health." Above all, said panelist Makayla Schlegel of Youth ERA, kids need to know that there is nothing wrong with feeling anxiety, depression or fear, and that there are always resources to help. "You're not abnormal for having a mental health problem," Schlegel said. "Probably almost all of us during one point have gone through it."